One of the, rare, fine spring days in London. Being East London, the streets are impassable: tipsy shrieking hipsters in large sunglasses, Columbia road’s (overpriced) flower-sellers, fixed-gear bikes, prams, and sausage dogs. 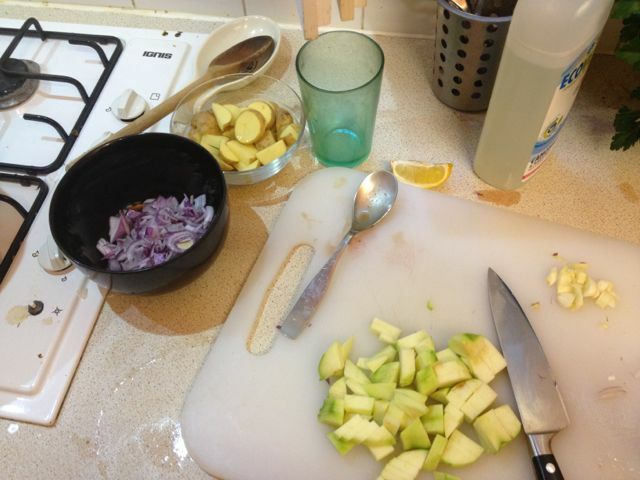 Madame Eatthehipster (“ETH”) was off preparing for her degree show, and I had free reign to prepare a massive Spanish lunch, recalling long lazy afternoons in the Mediterranean littoral: Sicily, Capri, Perpignan…. I had as a guide Patience Gray’s Honey From a Weed, a travel journal and cookbook from her time in Puglia, Toscana (her husband was a sculptor hence they lived near the marble quarries of Carrara), Catalunya, and Provence; that bible for cooks in 1980s England who would rather be (and eventually end up) somewhere more clement than a slightly dreary, often cold, and mostly cloudy island. Menu: a fabada from Asturias; hake and clams with cider, also of Asturias; and a classical Valencian paella (albeit with addition of mussels and chorizo to the customary rabbit). On our recent return to Madrid, betwixt the morbid glories of Goya’s “Black Paintings”, copious gintonics (the Spanish have an abiding love for England, dating I suppose from the Penninsular Wars), and the austere grandeur of Philip II’s great monastery-fortress of San Lorenzo El Escorial, we had some of our best meals at the restaurant Asturianos (94 Calle de Vallehermoso). Honourable mentions: Casa Fidel in Chueca, and Cafe Motha in Letras. 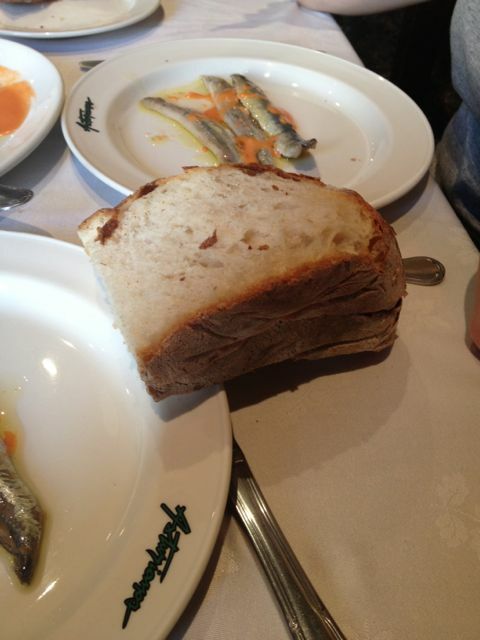 As I don’t know Spain intimately, I speak under caution, but the best food apparently is found in the northern regions: Galicia, Asturias, the Basque Country, and of course, Catalunya. Much of the centre and south of the country is arid, lacking in vegetation, and in a, probably historico-religiously inspired, fanatical awe of the pig, in all its guises. Nothing wrong with pigs, but they’re terribly indigestible and fattening. 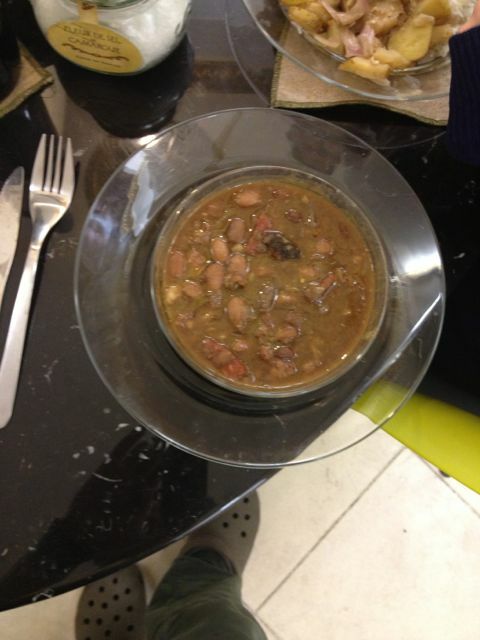 The fabada is a simple dish of beans, chorizo, and blood sausage (morcilla), both, well, porcine in provenance. It’s often a meal in itself, lovely for the winter, and painful in the summer. 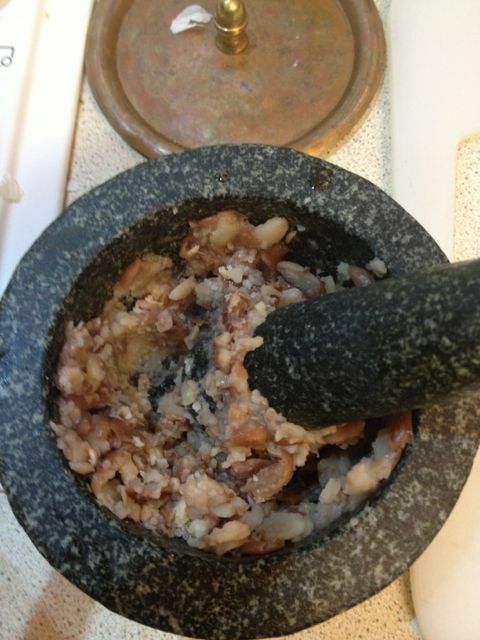 The recipe is simple: a hash of onions and garlic are browned (Gray uses the Catalan term sofregit like the Italian soffrito), into which the meat is dropped, rendering the fat out. 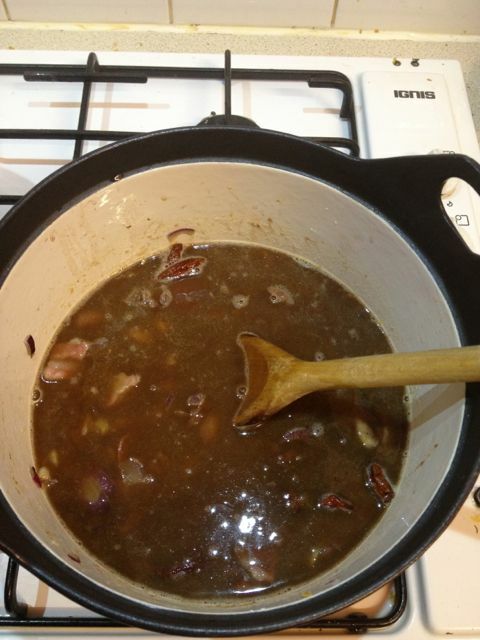 The beans, preferably the white beans from Asturias region (though I used borlotti, which gives a completely different colour and less neutral flavour), must be soaked and boiled ahead of time. When they’re soft, put them in with the meat/sofregit mixture, cover with water or stock, a little smoked paprika, and a bay leaf. Simmer on medium heat for 1-2 hours. 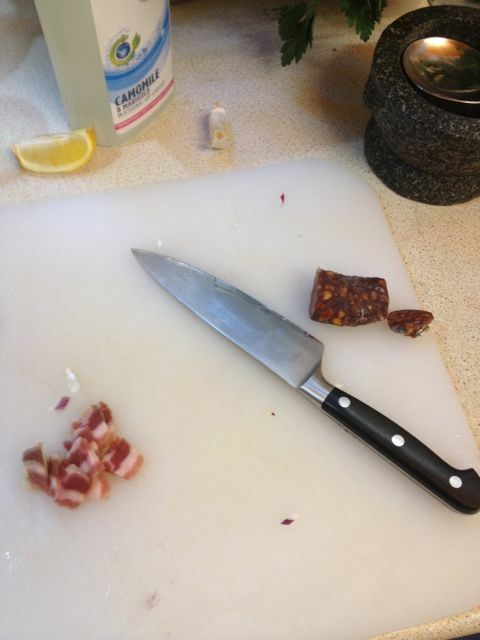 If using blood sausage, put that in near the end. Fabada served. 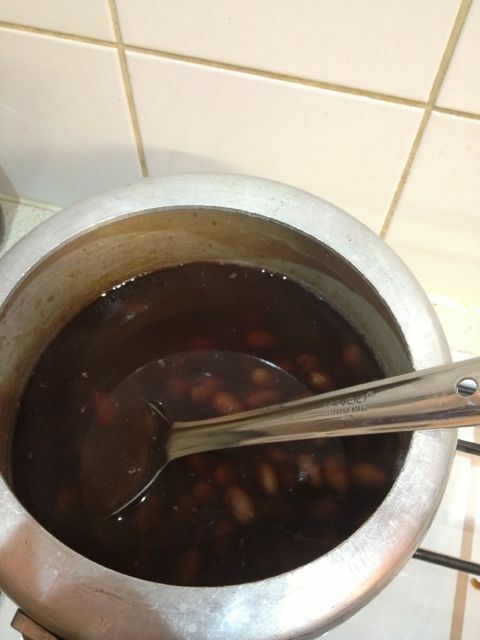 Borlotti beans give a browner colour than true Asturian fabada. 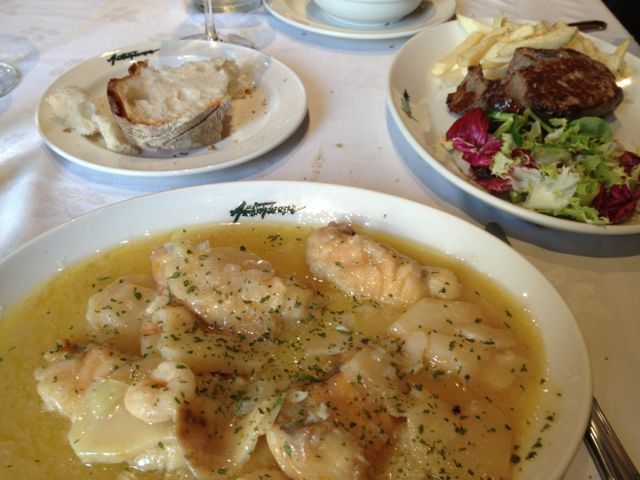 Less heavy, and perhaps more distinctive, was the fantastic dish of hake, clams and cider. I have long enjoyed making the traditional Madrileno dish of hake and clams in a salsa verde (parsley and garlic sauce), but this variation has a terrific sweet/sour flavour and highlights the splendid fish and clams. 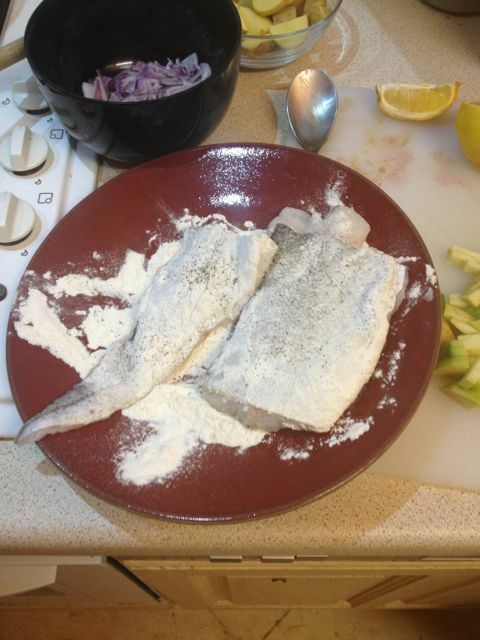 Start by flouring the hake and browning it lightly, then place in a warming oven. 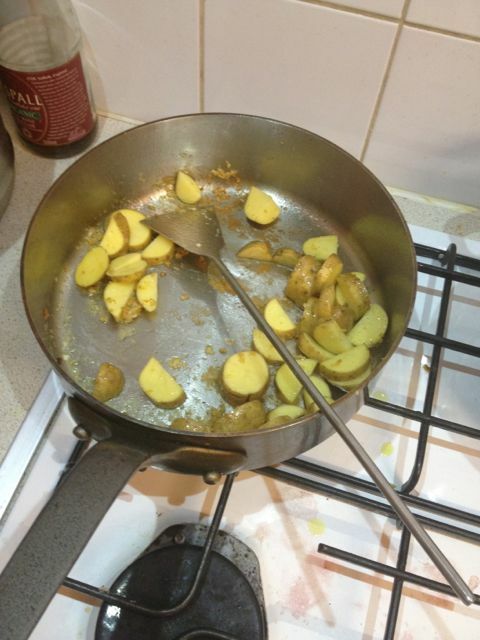 Fry some diced potato in the same oil until brown, then add minced onions, minced garlic, diced skinned apples (I used cooking apples that are quite sour, Granny Smith should work well). 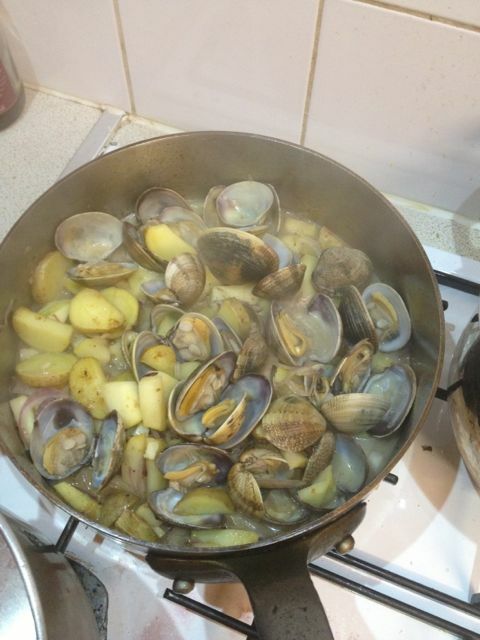 Meanwhile, steam the clams to get them to open, then toss into the potato/apple mix, and add in a little of the clam broth, scraping the bottom of the pan. 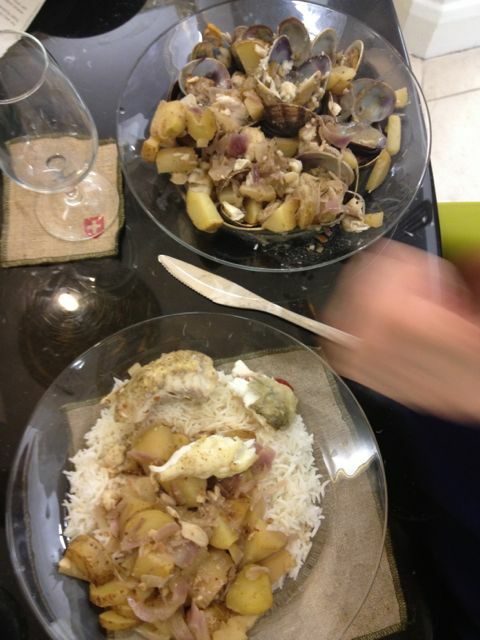 Once the apples are soft, place the hake on top, and pour in some cider to taste (note, English and French ciders are quite sweet, in comparison to Asturian, so you’ll probably need less cider and perhaps a little white wine vinegar to compensate). Bake in the oven for 10 minutes or so. 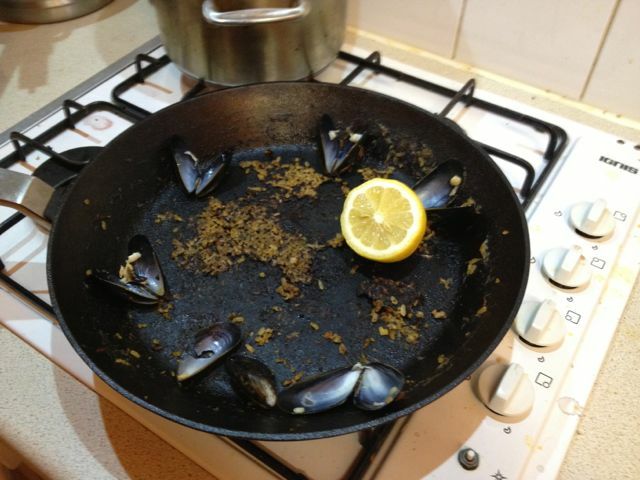 Place fish on a warm serving plate, pour over the sauce and clams, and sprinkle with chopped parsley. 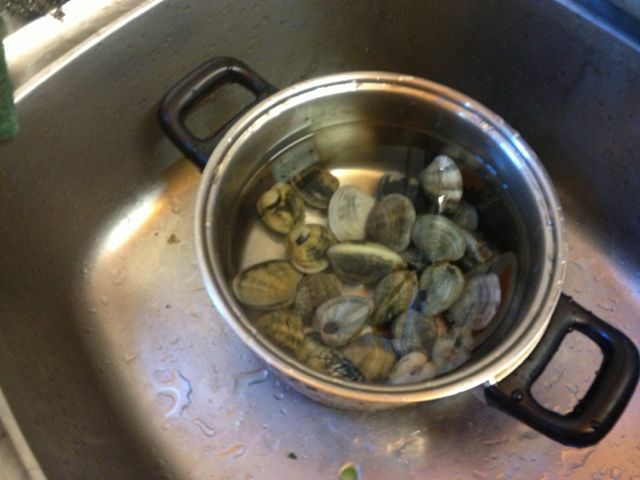 If there’s too much liquid, set the clams aside and fiercely reduce the sauce. 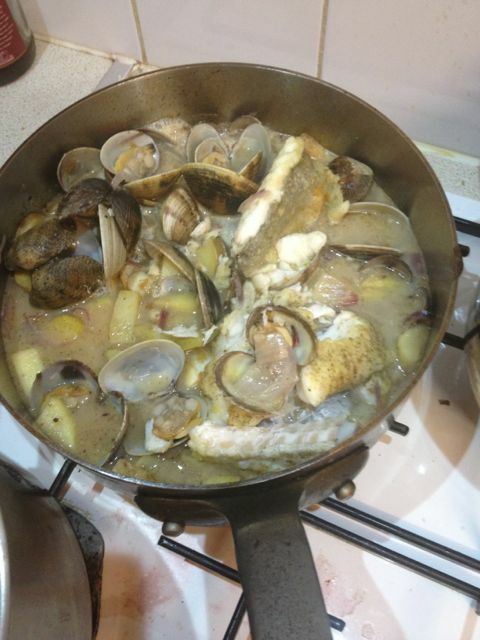 Hake & clams in cider. Served with rice, but rice is definitely not needed (especially with a paella to follow). 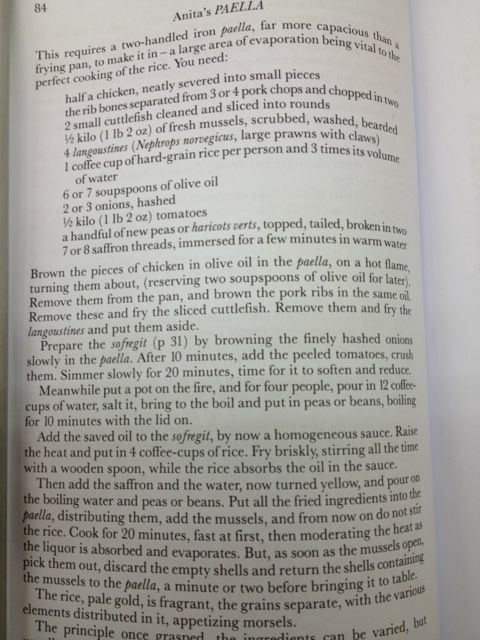 I suppose the important takeaways from both recipes: use the correct rice (Calasparra in preference to risotto rice – unlike in a risotto, one doesn’t want starch pouring out of the grains, rather they should end up absorbing all the liquid and faintly crisping up), keep ingredients simple and (reasonably) faithful to the region, use the right pan (a wide-flat pan, ideally an iron paella pan, to ensure maximum evaporation), and most importantly (again unlike risotto), don’t stir the rice. 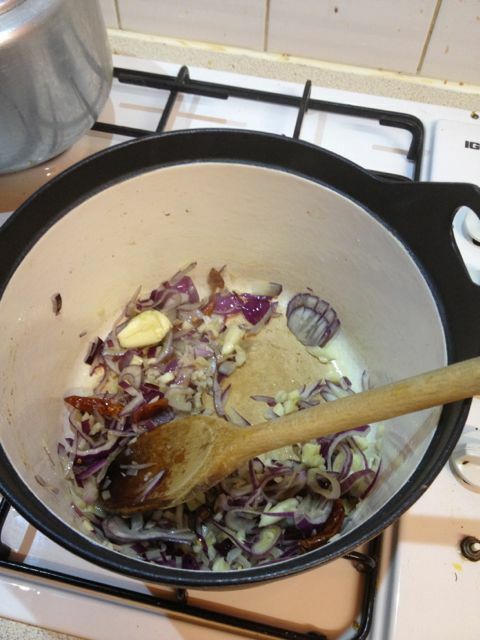 At its best, there should be a burnt layer at the bottom of the pan, the socarrat, which won’t happen if the dish is stirred. Sadly little to see of the paella but a few lonely shells. Rabbit was et, bones, liver & all. Wines: a French cider (from Cyril Zangs) for the Asturian dishes, and a fine Rioja rose (from Urbana) for the paella. 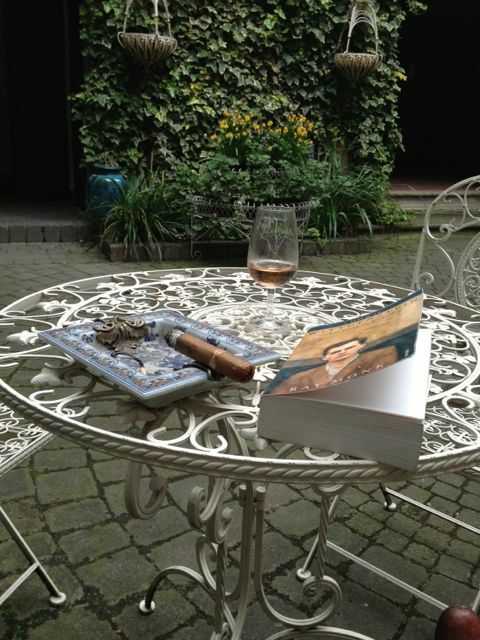 To end: a cigar from Ramon Allones in my faintly-Andalucian courtyard, listening to the blackbirds building their nest in the vines above. And the Emirates A380 circling above for landing at LHR.